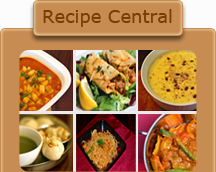 In a mixing bowl, take 2 cups yogurt, whisk well, add in 1 tsp oil, salt, red chili powder, ginger garlic green chili paste,2 tsp lemon juice, tandoori color, garam masala, tandoori masala powder, chaat powder and mix all together, and wash the chicken pieces well and add to the spiced yogurt. Allow to marinate for about 6 to 8 hours. Pre Heat a barbeque grill to a medium heat. Remove chicken pieces from marinade and carefully place chicken on an oiled wired rack and cook chicken at for about 30 to 35 minutes, brush little oil on both sides, and browning both sides of the chicken and cook till chicken is tender. Remove barbecued chicken. Chicken can also be baked by placing marinated chicken pieces on a foiled baking tray, to bake at 375 degrees, for about 20 minutes, baking cook chicken on grill, using a brush apply little oil over the chicken pieces, continue grilling chicken , for about 10 minutes on each side of the chicken. 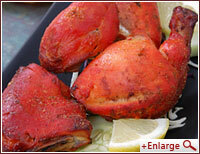 Remove chicken when done and place on a plate and sprinkle some chat masala on the chicken before serving.